Since I’ve been living in New York, there’s hardly been an opportunity to wear the skirt, so I practically forgot about it. Then last spring when I was preparing to go to Israel, I went rummaging through my wardrobe in an almost hopeless attempt to find “very conservative attire.” I came across my trusty skirt and sure enough, it was a perfect combo with any number of sweaters for my visits to synagogues and other holy places of the Jewish and Muslim faiths. The first time I wore that skirt I weighed about 110 -113 pounds. Today, I am about 10 pounds heavier and feeling FAT. As flattering as it is to be able to fit into clothing I bought more than a decade ago, it’s also revealing the areas where the fabric is clinging much closer than before. More so, it brings to light the issue of diet and exercise and the importance of maintaining a healthful lifestyle. 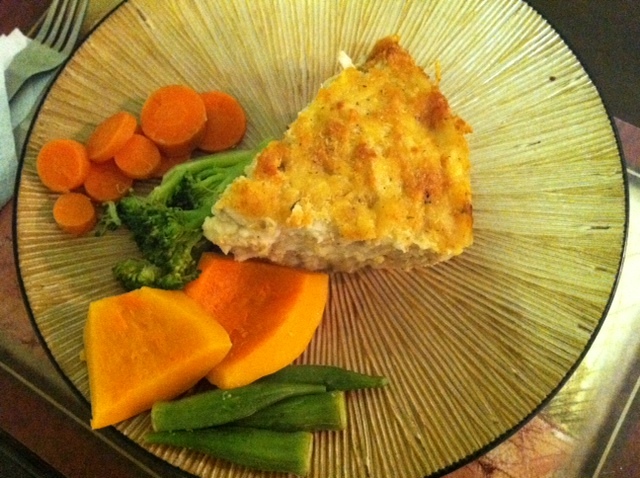 My home cooked white yam and tilapia shepherd’s pie with vegetables. I am no stranger to a diet and exercise regiment. I was a track athlete throughout my secondary school life and into my early 20’s. And for more than half my life, I was a vegetarian. I currently maintain a seafood/fish diet and occasionally chicken (which I quite like). After I stopped competing in track, I continued running for fun and regular exercise. Then in my mid-20’s, I was invited by an instructor at a top gym in Barbados to sign up. I told him I wanted big muscles. He promised to help me, but warned that I must be willing to pump some iron. From my track days, I always loved weight training, so I was game. After assessing my body, (height, weight – body mass index etc), he then accompanied me to the supermarket for some grocery shopping to ensure that my diet would complement my exercise routine. He remained my personal trainer for the next year; after which, I started devising my own workouts. I maintained this gym program on and off till I left Barbados. I thought I could easily fit an exercise routine into my full-time academic life in New York, but this proved impossible. I am ashamed to say it took almost four years before I ever got back to the gym. But what’s of note is that although I was lacking vital regular exercise, I was eating healthily. Sure, I have a sweet tooth and must satisfy my chocolate cake, Häagen-Dazs and Snickers cravings. But from experience, I was naturally or maybe subconsciously able to calculate and stay within my recommended daily calorie intake. I was ever mindful to fill up on my vegetables, fruits, drink lots of water, balance my consumption of fats, carbs etc, use lots of organic products and generally stayed away from fried foods. And I’m proud to say that most of the food I eat is home cooked by me as seen in this video of my tasty salmon dish. While this was all great, it bothered me that I was not working out. 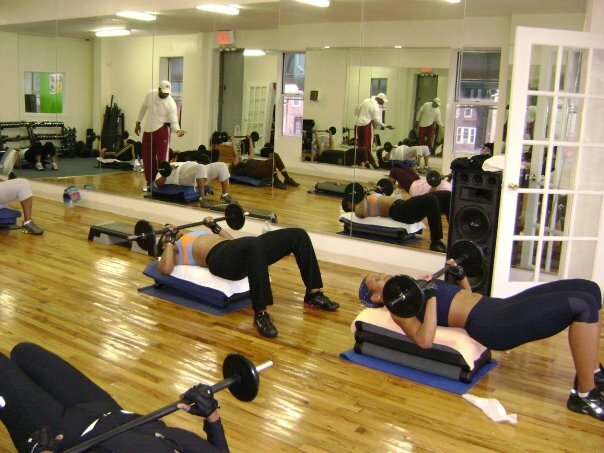 At the start of 2009, I signed up at a neighborhood gym, Q-Fitness owned by a friend and fellow Barbadian Quinn, who I had known for more than half my life. I preferred to support his entrepreneurship rather than join one of the more established gyms. Added to that, he is highly certified and skilled in almost every area of fitness from martial arts, to pilates, aerobics, kickboxing and more. Quinn agreed to be my personal trainer. We decided on three sessions a week and the other times I’d work out by myself. I wish he or someone else would have warned me of the “torture” in store – of not working out for years and then doing so with him! Over the next few weeks every inch of me ached. Sometimes it was too excruciating to figure out which body part. There were days I was sure I wouldn’t have been able to climb out of bed and if I did, it was with the mobility of an 80-year-old arthritis patient. Still, I didn’t give up and soon I was getting results. I lost a few inches, toned up quite a bit, was feeling much more fit and was again sliding into my size 0-1 jeans with ease! Lol! Thanks for reading, Lisa! I’m glad someone else can identify with my pain! Hahaha! Nice read!!! Most things in life require discipline for success…therein lies my problem…ha ha ha!